One of the major tasks of a Web Content Writer is to create content for the website as well as for the blogs that go on a business’ web page. 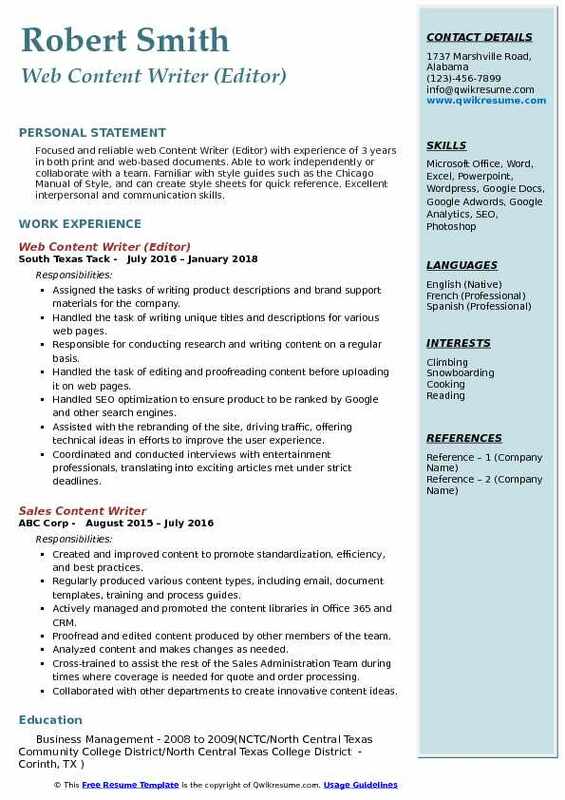 In a successful Web Content Writer Resume, the following roles and responsibilities are normally mentioned– produce high-quality content, edit content written by other members, collaborate with the design and development team to create contents that fit the UI and design, and to analyze the content metrics and statistics. Some of the key skills and qualifications needed to embark on this interesting career are strong language skills, attention to detail, and perfect grammar and vocabulary. To apply for this job role, minimum education required is a Bachelor’s Degree in English, Computer Science, and Engineering or Information Technology. While a Master’s Degree is considered as a bonus, necessary work experience or at least an internship in the relevant field is required. 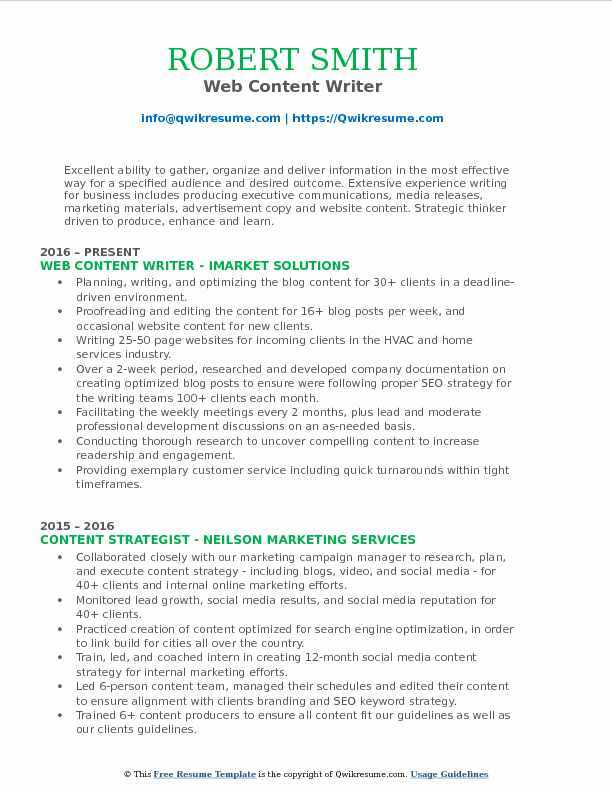 Summary : Web Content Writer would like to obtain a career position or long-term assignment where I can utilize the training, 25 years of experience and creativity that I possess to create engaging, profitable content for my employer. Writing convincing, results-oriented copy for a broad spectrum of websites from technical to casual. Writing sales and call-to-action promotional materials, brochures, flyer copy and e-mail newsletters. Organic SEO including link building, directory submission, keyword research, domain name research, Facebook ad campaigns, Twitter account setup, Youtube channel creation and another Web 2.0 channels. Writing SEO optimized website content to drive organic traffic for the websites. Publishing news articles for an online newspaper. Researching topics conducted interviews, and added links to relevant websites. Monitored industry news and cultivated sources to generate multiple daily news blog posts. Wrote articles, designed creative content, and published them online via WordPress. Summary : Web Content Writer is looking to secure a position within an organization to provide services and strategic assistance in a customer service capacity seeking to make a difference in operations and processes. Checking and generating the appropriate keywords to use in the articles & pages. Creating the information to promote or sell the company, product or service described on the website. Producing content to entice and engage visitors, so they continue browsing on the current website. Generating content that is smart in its use of keywords and is focused on Search Engine Optimization (SEO). Creating content that allows the site visitors to obtain the information they want quickly and efficiently. Learning as well as educating business managers about social media marketing and its uses for SMEs. Writing and editing the instructional and marketing web copy. Collaborating on the design of websites, mobile apps, and blogs. Creating help text for user interfaces (microscopy). Researching subject areas and optimize content for social media channels. 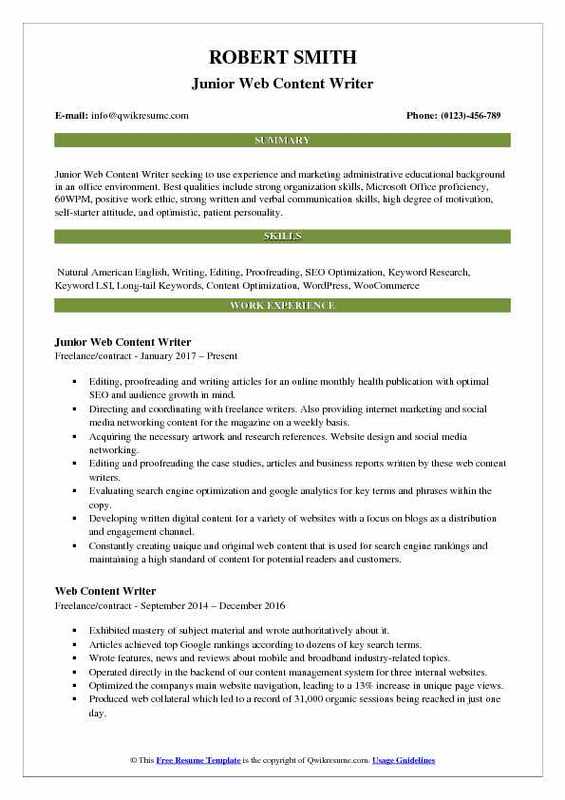 Objective : Junior Web Content Writer seeking to use experience and marketing administrative educational background in an office environment. Best qualities include strong organization skills, Microsoft Office proficiency, 60WPM, positive work ethic, strong written and verbal communication skills, high degree of motivation, self-starter attitude, and optimistic, patient personality. Editing, proofreading and writing articles for an online monthly health publication with optimal SEO and audience growth in mind. Directing and coordinating with freelance writers. Also providing internet marketing and social media networking content for the magazine on a weekly basis. Acquiring the necessary artwork and research references. Website design and social media networking. Editing and proofreading the case studies, articles and business reports written by these web content writers. Evaluating search engine optimization and google analytics for key terms and phrases within the copy. Developing written digital content for a variety of websites with a focus on blogs as a distribution and engagement channel. Constantly creating unique and original web content that is used for search engine rankings and maintaining a high standard of content for potential readers and customers. Creating appealing and informative articles, blogs, and instructional posts with a focus on growing brand awareness and SEO. 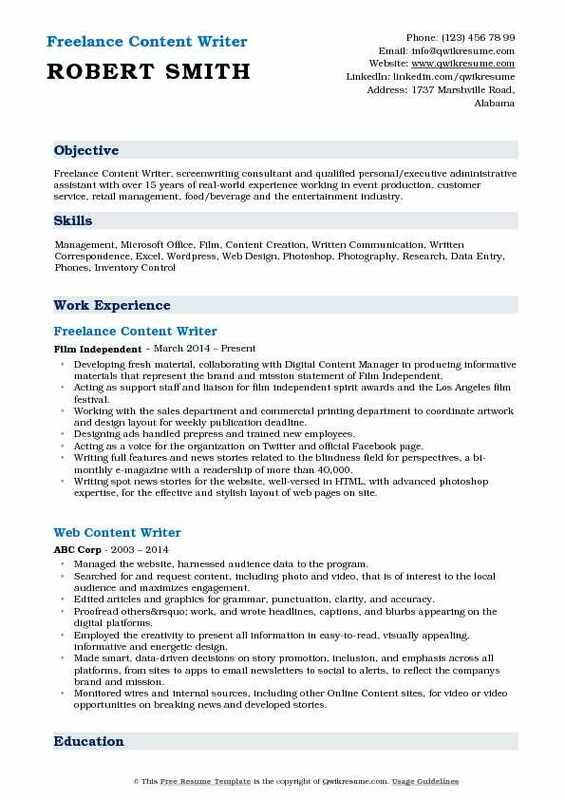 Objective : Extensively trained as a Web Content Writer/Editor with knowledge of blogging, content creation, and academic writing processes. I have completed numerous doctoral level writing assignments and demonstrated my capacity to provide professional and timely work on over 300 projects. It is this commitment to high-quality and meticulous work that I can confidently bring to your company. 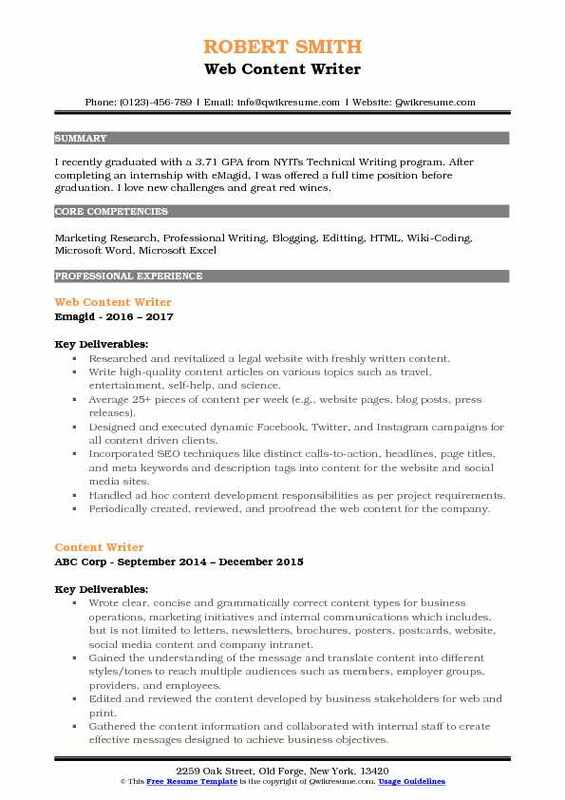 Skills : Academic writing, Editing, Proofreading, Research Article writing, Fact-checking, APA, MLA, CMS, Turabian formatting, Creative writing, Content creation, Blogging. 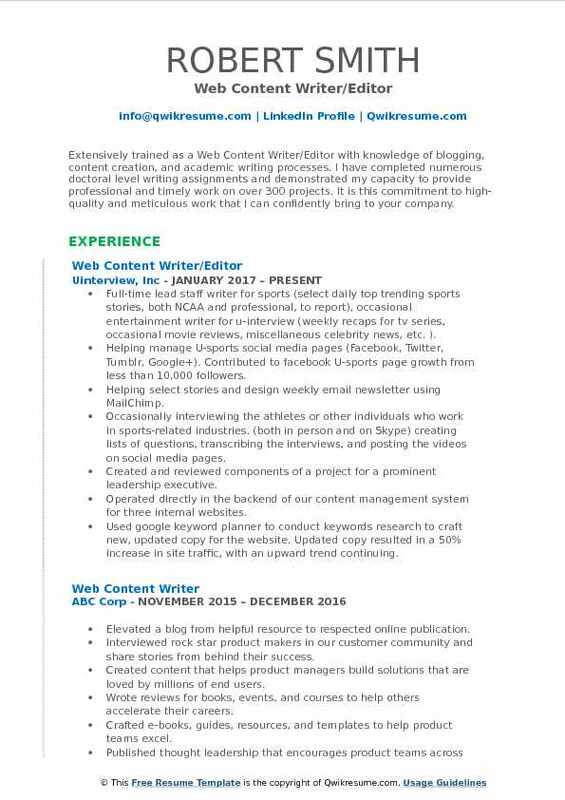 Full-time lead staff writer for sports (select daily top trending sports stories, both NCAA and professional, to report), occasional entertainment writer for u-interview (weekly recaps for tv series, occasional movie reviews, miscellaneous celebrity news, etc. ). Helping manage U-sports social media pages (Facebook, Twitter, Tumblr, Google+). Contributed to facebook U-sports page growth from less than 10,000 followers. Helping select stories and design weekly email newsletter using MailChimp. Occasionally interviewing the athletes or other individuals who work in sports-related industries. (both in person and on Skype): creating lists of questions, transcribing the interviews, and posting the videos on social media pages. Created and reviewed components of a project for a prominent leadership executive. Operated directly in the backend of our content management system for three internal websites. Used google keyword planner to conduct keywords research to craft new, updated copy for the website. Updated copy resulted in a 50% increase in site traffic, with an upward trend continuing. 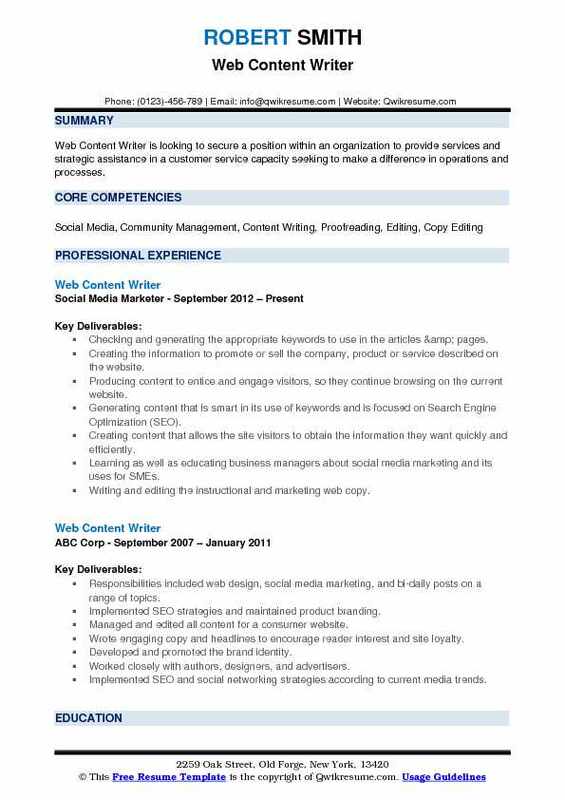 Objective : Focused and reliable web Content Writer (Editor) with experience of 3 years in both print and web-based documents. Able to work independently or collaborate with a team. Familiar with style guides such as the Chicago Manual of Style, and can create style sheets for quick reference. Excellent interpersonal and communication skills. Assigned the tasks of writing product descriptions and brand support materials for the company. Handled the task of writing unique titles and descriptions for various web pages. Responsible for conducting research and writing content on a regular basis. Handled the task of editing and proofreading content before uploading it on web pages. Handled SEO optimization to ensure product to be ranked by Google and other search engines. Assisted with the rebranding of the site, driving traffic, offering technical ideas in efforts to improve the user experience. Coordinated and conducted interviews with entertainment professionals, translating into exciting articles met under strict deadlines. Wrote feature articles, news blogs, and other original online content. Engaged readers with clear, captivating and conversational language. Entrusted to edit copy submitted from remote freelance writers using the WordPress content management system. 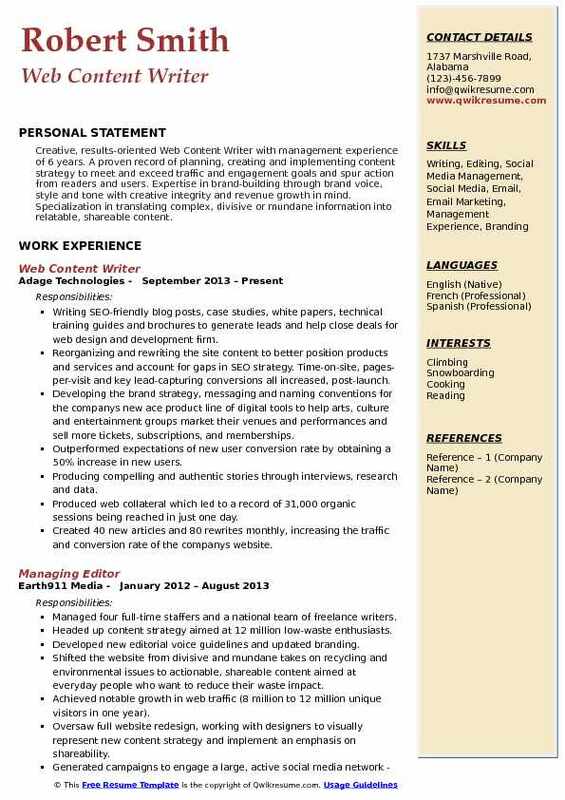 Summary : Freelance Content Writer, screenwriting consultant and qualified personal/executive administrative assistant with over 15 years of real-world experience working in event production, customer service, retail management, food/beverage and the entertainment industry. Developing fresh material, collaborating with Digital Content Manager in producing informative materials that represent the brand and mission statement of Film Independent. Acting as support staff and liaison for film independent spirit awards and the Los Angeles film festival. Working with the sales department and commercial printing department to coordinate artwork and design layout for weekly publication deadline. Designing ads handled prepress and trained new employees. Acting as a voice for the organization on Twitter and official Facebook page. Writing full features and news stories related to the blindness field for perspectives, a bi-monthly e-magazine with a readership of more than 40,000. Writing spot news stories for the website, well-versed in HTML, with advanced photoshop expertise, for the effective and stylish layout of web pages on site. Editing the existing web pages for SEO and building directories for said pages to facilitate site navigation. Objective : Excellent ability to gather, organize and deliver information in the most effective way for a specified audience and desired outcome. Extensive experience writing for business includes producing executive communications, media releases, marketing materials, advertisement copy and website content. Strategic thinker driven to produce, enhance and learn. Planning, writing, and optimizing the blog content for 30+ clients in a deadline-driven environment. Proofreading and editing the content for 16+ blog posts per week, and occasional website content for new clients. Writing 25-50 page websites for incoming clients in the HVAC and home services industry. Over a 2-week period, researched and developed company documentation on creating optimized blog posts to ensure we're following proper SEO strategy for the writing teams 100+ clients each month. Facilitating the weekly meetings every 2 months, plus lead and moderate professional development discussions on an as-needed basis. Conducting thorough research to uncover compelling content to increase readership and engagement. Providing exemplary customer service including quick turnarounds within tight timeframes. Creating, organizing, and managing the content for consumer-based digital properties. Objective : I recently graduated with a 3.71 GPA from NYITs Technical Writing program. After completing an internship with eMagid, I was offered a full time position before graduation. I love new challenges and great red wines. Researched and revitalized a legal website with freshly written content. Write high-quality content articles on various topics such as travel, entertainment, self-help, and science. Average 25+ pieces of content per week (e.g., website pages, blog posts, press releases). Designed and executed dynamic Facebook, Twitter, and Instagram campaigns for all content driven clients. Incorporated SEO techniques like distinct calls-to-action, headlines, page titles, and meta keywords and description tags into content for the website and social media sites. Handled ad hoc content development responsibilities as per project requirements. Periodically created, reviewed, and proofread the web content for the company. 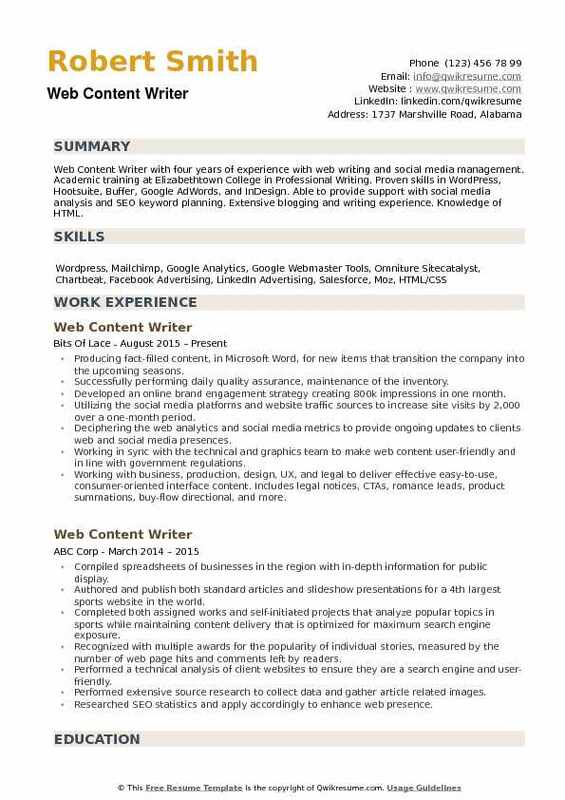 Headline : Creative, results-oriented Web Content Writer with management experience of 6 years. A proven record of planning, creating and implementing content strategy to meet and exceed traffic and engagement goals and spur action from readers and users. Expertise in brand-building through brand voice, style and tone with creative integrity and revenue growth in mind. Specialization in translating complex, divisive or mundane information into relatable, shareable content. Writing SEO-friendly blog posts, case studies, white papers, technical training guides and brochures to generate leads and help close deals for web design and development firm. Reorganizing and rewriting the site content to better position products and services and account for gaps in SEO strategy. Time-on-site, pages-per-visit and key lead-capturing conversions all increased, post-launch. Developing the brand strategy, messaging and naming conventions for the company's new ace product line of digital tools to help arts, culture and entertainment groups market their venues and performances and sell more tickets, subscriptions, and memberships. Outperformed expectations of new user conversion rate by obtaining a 50% increase in new users. Producing compelling and authentic stories through interviews, research and data. Produced web collateral which led to a record of 31,000 organic sessions being reached in just one day. Created 40 new articles and 80 rewrites monthly, increasing the traffic and conversion rate of the companys website. 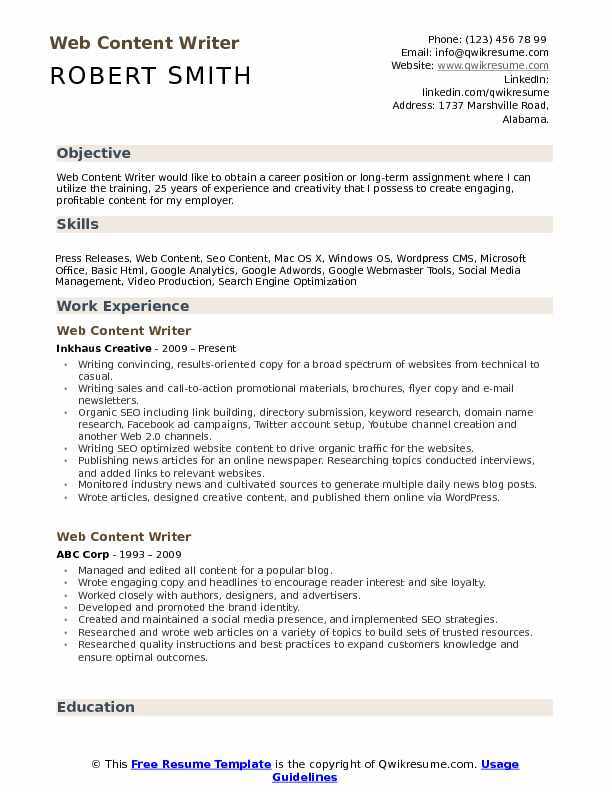 Objective : Web Content Writer with four years of experience with web writing and social media management. Academic training at Elizabethtown College in Professional Writing. Proven skills in WordPress, Hootsuite, Buffer, Google AdWords, and InDesign. Able to provide support with social media analysis and SEO keyword planning. Extensive blogging and writing experience. Knowledge of HTML. Producing fact-filled content, in Microsoft Word, for new items that transition the company into the upcoming seasons. Successfully performing daily quality assurance, maintenance of the inventory. Developed an online brand engagement strategy creating 800k impressions in one month. Utilizing the social media platforms and website traffic sources to increase site visits by 2,000 over a one-month period. Deciphering the web analytics and social media metrics to provide ongoing updates to clients web and social media presences. Working in sync with the technical and graphics team to make web content user-friendly and in line with government regulations. Working with business, production, design, UX, and legal to deliver effective easy-to-use, consumer-oriented interface content. Includes legal notices, CTAs, romance leads, product summations, buy-flow directional, and more.